And, yes, I did go around quoting This is Spinal Tap. Back in late March, I was preparing for something quite different than what I have done the past 2 ½ months. I was called into the colonel’s office and told “things in Basrah have really heated up and everything has changed.” I was then informed that I was to be sent to Basrah to assist a US team in the area, and I would also be working with the Iraqi Army’s 14th Division. By nature I am a bit of a stick-in-the-mud. I try to get comfortable and find a routine wherever I am. Needless to say, this quite disrupted what I had settled into. I didn’t go kicking and screaming, but I was a bit perturbed. However, I was also interested and couldn’t really complain too much, as there were plenty of others in a lot worse situations than I. When I got to Basrah, the first “Charge of the Knights” had taken place, and the IA was readying for further operations into the city. I was then informed that I would not be staying at the large base at the Basrah International Airport, but moving out to the 14th Division’s HQ, at the then named camp of Mahmud Al Kasim. I was the only American there. When I arrived there was a single British officer, 2 Lance Corporals and 4 Privates from the 1st Scots Battle Group/Royal Scots Borderers. A much larger Coalition presence was at the Basrah Operations Command. Somehow we managed to feed information to the Multinational Division South-East Headquarters and the US team I was there to support - plus help the 14th Division staff in anyway we could. The British officer was the Operations/Intel brains of the outfit, I was the Logistics and Civil Affairs guy. We both covered any other fields we could – Communications, Personnel, and the like. 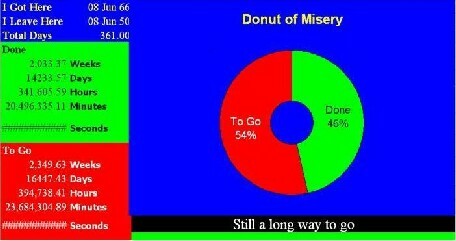 For one really stressful two day period, I was the only Coalition officer there. All the while, the US team I was assisting at another location was working their asses off to see that the Iraqi Army was handling its enormous logistical challenges. I don’t know how they managed to keep going sometimes – their work load was staggering. Then we started to get more help – a few of the Jocks (Scottish enlisted soldiers) shuffled around, and we gained a Signaler or two more. We got more British officers on scene to take up the various advisory functions. We also got better and more communications gear, computers, and a couple of vehicles. While all this was starting to take place, the Iraqis had won the Battle for Basrah. Now our job became helping make sure they were able to keep what they had won, and learn from early operations. The Iraqis paused to mourn their dead, caught up on some rest, maintenance and refitting – and went back to operations. Their progress is never enough if you hold them to American military standards, but is undeniable by anyone who watched them throughout this time. They are slowly and inexorably gaining strength, experience and an identity of their own. It was elements of three Iraqi Army divisions and two National Police brigades that won in Basrah. We, the Coalition, helped – and I believe that our help kept the casualties and damage down - but make no mistake, this was an Iraqi victory won by the Iraqi Security Forces. The people of Basrah are why the ISF are winning the post-battle too. They have experienced militia/religious fanatic/thug rule and they don’t want any more truck with it. It is the ordinary Abduls, Hattams and Fatimas of Basrah who point out the weapons caches, told the ISF where the JAM and Iranians were hiding, and it is they who are getting to step out into the light at last. As I was told back in March, my assignment would not be permanent. I have now left Camp Al Shaheed Wessam and the 14th Division. I will be moving on to a new assignment after I take a couple of weeks of leave. I leave behind a growing and increasingly effective Iraqi Army unit, a very dedicated and hardworking US team nearby, and a serious British Military Transition Team to continue mentoring the 14th. I may have left Basrah Province in person, but I will always remember the crucible moments in which part of an Army, and part of a Nation were fused together. I was checking the SIGACTS (Significant Activities) for the last 24 hours and was surprised to see nothing posted. I thought to myself "c'mon you lazy #$%&, get the site updated!" So I dug a little deeper and saw a summary that basically said that nothing happened for a 24 hour period. Strange. I hope it isn't one of those "it's quiet...too quiet" moments. Probably not - as things have been going fairly well down here. But I'll keep my eyes and ears open regardless. So, how was your morning? 2:30AM I am out unloading food and bottled water off of some trucks that brought us some well appreciated supplies. I'd make a pretty good Teamster. I can just see every tanker reading this begin shuddering in sympathy. Then I make my way to the assembly room/work room and get a phone call from Operations - "did you happen to hear a large explosion southwards a few minutes ago?" Huh? Uh, not as such. Is there something I should know...? Then I sat down with some powerful instant coffee and made CDs of technical manuals and training pamphlets that have been translated into Arabic. I think my Iraqi counterparts will be pleased. I wonder what this afternoon will bring? I am back down Basrah-way for a little while longer. OK, maybe not. But I took off the splint and bandages yesterday. Once the last stiffness and swelling go away, this will be relegated to the laugh and joke about arena. I should clarify - me laughing about it, not someone else laughing at me...heh. Why is this not being reported? Retreat or Redeployment? 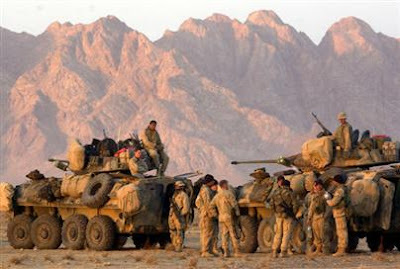 Taliban insurgents are fleeing south towards the Afghan border with Pakistan in the face of a U.S. Marines offensive in volatile Helmand province, the NATO commander in Afghanistan said on Monday. 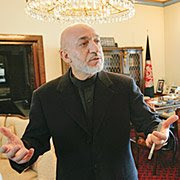 President Hamid Karzai has come under fire for not doing enough to stem corruption in Afghanistan. He speaks to DER SPIEGEL about the coalition forces' ties with warlords, rumors about his family's influence and why he believes dirty deals are sometimes necessary. While there are plenty I dislike, there are few in this world I truly hate. Gulbuddin Hekmatyar is one of them. He is probably one I would kill without hesitation. He is evil, embodied in someone that could have helped his country, but has chosen to bathe in the blood of his own people instead. Reading this did not help. I can only hope the ANA or a Predator with a Hellfire missile catches up with him. Or, more specifically, "why do I help the Iraqi Army?" There are many reasons - but Sudarsan Raghavan seems to have captured the images of what it is I seek to make common and ordinary. Never mind the hedging and such - that is de rigeur for almost all in the media when reporting on Iraq. But instead, give them credit for bringing these pictures out for everyone to see.